Phase contrast is one of more popular contrast techniques developed in the 1930's by Frits Zernike. This technique helps make unstained objects such as bacteria, protozoans, blood cells, sperm, etc, visible. Phase contrast is a method where a portion of the light is treated differently from the rest, and caused to interfere with the rest in a way to product a visible image from an otherwise transparent specimen. 1. Phase Contrast Objectives: Phase contrast requires special objectives called phase contrast objectives. These objectives have a phase plate inside of them. If you look through a phase objective off of a microscope you can see this plate as a ring in the objective. The higher magnification objective, the smaller the ring. The objective can be identified on the microscope by reading the information on the objective sleeve. A phase objective will say Ph on it, typically listed after the Numerical Aperature. Following the Ph will be a number, usually 1, 2, or 3. This is used to reference which annulus to engage into position (more on that below). 2. Phase Contrast Condenser: The condenser will contain what is called the annulus. The annulus is the second component to complete the optical aspect of phase contrast. The annulus must match with the phase plate (ring) inside of the phase contrast objective. Each annulus will be marked just as the objective with Ph followed by a number - 1, 2, or 3. In order to achieve phase your condenser must be centered and your phase annulus must be aligned. Once this is done in order to achieve phase contrast simply match the objective to the corresponding annulus. For example if your objective reads Ph1 you should engage the phase annulus which reads Ph1. Phase Contrast Slider: If your microscope has a slot in the condenser then you can use a phase contrast slider which contains the phase annulus. The slider will have a brightfield position and positions with the phase annulus. This method is a more economical method than the alternative phase turret condenser. It typically has a limitation of only being able to carry two phase annulus. The advantage of a phase slider is that they usually come per-centered and aligned. Phase Contrast Turret Condenser: A phase contrast turret condenser is a regular condenser with a turret inside. The turret contains the phase annulus and will typically have 5 positions. Three positions are dedicated for the annulus, one position for brighfield, and one for darkfield. A phase contrast turret condenser is easier to use as you simply rotate the correct position into place, the condenser makes it easy to see what position on the turret you are in. This style of condenser can be more complicated to align. 3. Phase Contrast Telescope: A phase contrast telescope is the tool that is used to make sure your phase contrast annulus are centered. Without proper centration you will not achieve phase contrast. In order to use a phase contrast telescope you remove one eypeice and put the telescope in its place. The telescope allows you to see both the phase plate (in the objective) and the phase annulus (in the condenser) in order to align them. How to align and center for phase contrast. Not sure which phase contrast microscope is appropriate for your application? 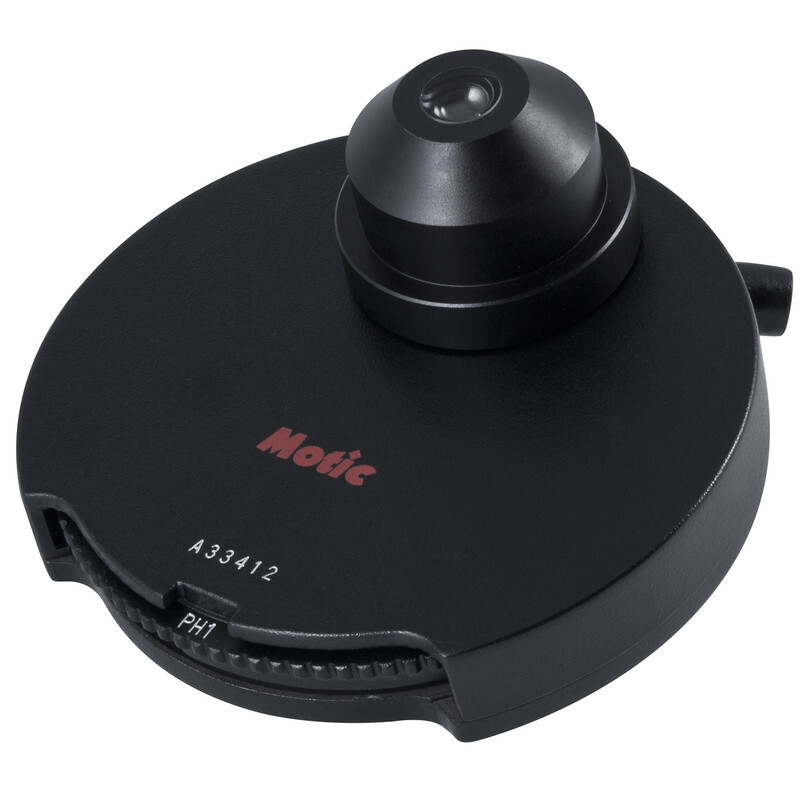 Need a custom configured phase contrast microscope? Ask our microscopy experts today! Shop our Phase Contrast Microscopes Today!